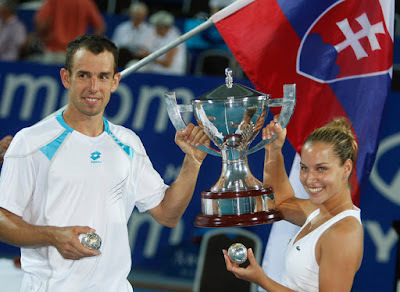 Slovak Republic pair of Dominik Hrbaty and Dominika Cibulkova pulled off a major upset to win the $1-million ITF Hyundai Hopman Cup tennis championship in Perth’s Burswood Dome. It was the Slovak nation’s 3rd Cup win in eight appearances at the international mixed teams championship. The victory was clinched by Hrbaty in a thrilling singles battle, beating Russia’s Marat Safin, a former world No. 1, 6-7 (5/7), 7-5, 7-6 (7/3). Earlier, Cibulkova had beaten world no. 3 Dinara Safina 6-7 (3/7), 6-1, 6-4. In a power-packed six hours of tennis, the Slovaks survived against higher-ranked opponents after both teams had gone into the final undefeated from their three round robin matches. The 19-year-old Cibulkova, ranked 19 in the world, converted five of her 10 break point opportunities in her singles win and completed the week unbeaten in four matches, plus two mixed doubles. Her partner, who celebrated his 31st birthday earlier in Cup week, survived numerous crisis moments as the powerful Safin blasted 22 aces past him. The victory belied Hrbaty’s singles ranking of 252 after a career high of 14. Safin, ranked at 29 after a year of injury, has announced that this could well be his last year on Tour. The Slovaks shared a winner’s prize of A$250,000, plus two diamond-encrusted tennis balls. P.S. If you do not know the relationship between Cibulkova and Jurgen Melzer, click here.